A love that defies Fate itself. A love so strong it doesn’t care about norms and written destinies. Althea and Landon have been friends since childhood and are near inseparable, but the clock is ticking and pressure is building from their family to find their destined mate and finally commit. But when the young boy that Althea has known all her life suddenly morphs into the imposing and handsome Alpha Landon, she finds herself drawn to him more than ever before and looking away from other potential suitors. With their parents pushing to keep them apart and obstacles mounting around them, Althea knows that she and Landon are not naturally destined to be each other’s mate, but can fate be changed in the quest for true love? 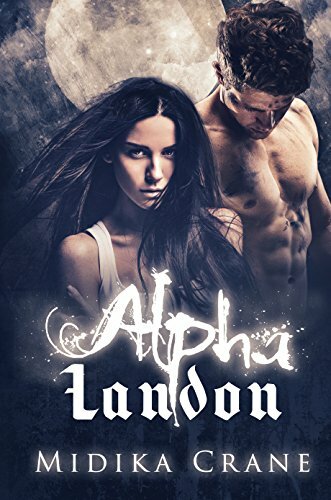 Alpha Landon is book 1 in the Alphas series by Midika Crane. Now, I have to laugh because I have read and reviewed this series backward. I started with Alpha Kaden, then Alpha Grayson and now Alpha Landon. Reading Alpha Landon, though, I now understand different relationships throughout the book. Like the hate/hate relationship with Kaden and Althea. It was fully explained in Alpha Landon. Relationships and characters that I was puzzling over in Alpha Kaden and Alpha Grayson made more sense. Also, the not shifting deal, which people had complained about, was fully explained and it actually made sense. Althea, I liked. She was not afraid to stand up for herself, even when she was in situations where she should have just cowered (mainly the scenes with Kaden). I did feel bad for her during parts of the book. It always seemed like she was getting the short end of the stick when it came to things. Like finding a mate. Her father was basically forcing guys down her throat to get a mating for her. Or her friendship and eventual relationship with Landon. She had to deal with his father, who was a huge jerk. But she also brought trouble onto herself. Like sneaking onto the Alpha’s land which got her thrown in jail and that is where she met Kace. Or attacking Natasha in the car on the ride back from Alpha Alden’s. Landon had an amazing transformation during the first few chapters of Alpha Landon. He went from a super skinny nerd to this buff Alpha. The transformation was insane and it did throw Althea for a loop. He was also super jealous of any attention paid to Althea and marked her as his mate….even though she wasn’t his to mark. I do wish that the book had more chapters written from his perspective because I would have loved to see what was going on in his head. What I didn’t get was how he was allowed to mark Althea as his mate….even though she was fated to be the mate of Coen, Kaden’s brother. Another thing that I wish that was explained because when I read that part, I went “How on earth can he do that“. It just puzzled me but considering what happened in Alpha Kaden, I am glad that the author chose to go the way she did. The whole storyline with Kace was confusing too. It was never said why he was in that prison or even exactly who he was to Kaden. I wish more details were given on that too. Even though he was in the book for a short amount of time, he definitely got my attention and, as weird as it sounds, my pity. Yes, I pitied a killer who was obsessed with Althea. He was thrown into that jail when he was 12 years old and was held there for 7 years. That had to of screwed him up even more than he was. The end of the book was great. What I liked is that while Landon and Althea had their happy ending, the other Alphas were still looking (or not looking) for theirs. And I loved the hint at Alpha Kaden’s storyline given in the epilogue! !